Why buy a second headset just for your home or office phone Use the Headset Buddy Adapter and your existing computer headset with phones and cell phones that have a single 2.5mm plug. A big productivity enhancer for home businesses, call centers, sales people, road warriors, or anyone who is on the phone all the time, but doesn't want to carry two headsets, one for the computer, and one for the phone. 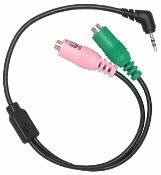 Specs: This amazing adaptor converts the standard headset 3.5mm mic/audio plugs to a standard 2.5mm plug, allowing you to use your favorite computer/laptop headset with your phone or cell phone. This adapter is designed for use with headsets that have two 3.5 mm. plugs; one for the microphone and one for the headphones/earpiece(s). The adapter outputs binaural sound for stereo headsets, meaning you will hear sound out of both ears. EU RoHS Compliant. This list is not all inclusive. Please look up the specifications on your specific phone to see if it has a 2.5mm headset jack. Most older mobile phones (not smartphones) and home phones have a 2.5mm jack.